I’m still in England. Have some Vintage Tink! Taken during the horrible month when I lived in a hotel in Fredericksburg so I could work while closing on the house and my Mom kept the Usual Suspects in Charlotte. We met up on the weekends at my parents’ house. 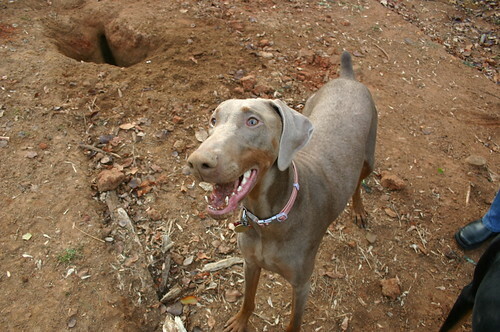 This was taken in the old garden at my parents’ house, where Tink found two gopher trails and was excavating them. We let her dig for a good hour, I swear, thinking she would get tired of it, but she never did!